This is a very busy bee, in my garden last week. 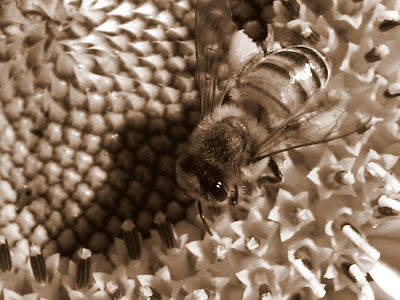 I used Picasa3 to convert to sepia. Visit all the Sepia tinted people here. What a great catch of the bee! The photo is excellent to begin with but the sepia brings out the details really well. Nicely done. That bee looks like it's on a sunflower. I like the sepia color. That bee photo is awesome! I'm sure the color one is beautiful but I like the Sepia, makes it look like you've had the photo for years. Nope, not working. I AM jealous. Nice photo of the bee and sunflower, Jan.
Ohhhh, my, I would never have imagined that would work, but it DOES!!! Very pretty!! !